The only hostility they have experienced so far is from an anti-Occupy Central activist, wearing a facemask, who emerged from the metro and began heckling them. But Lee was prepared. “We sang the Happy Birthday song… It is one of our strategies to confuse those people!” It worked. The baffled agitator left in confused embarrassment. 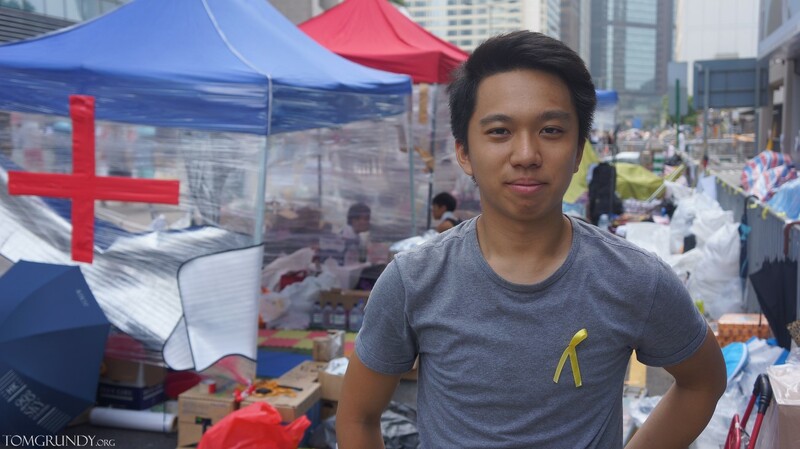 Lee is just one of the young demonstrators who have helped make the Umbrella Movement one of the “politest protests in the world.” Without oversight from any authorities, or even any leadership of their own, the pro-democracy protesters have created a clean, safe and orderly protest camp near government headquarters in Admiralty. Protesters erected sturdy make-shift bridges over road divisions, staffed by attendants to help people across. First aid booths and supply tents across the site are replenished by a team of 30 van drivers. Recharge points, showers and even a translation service hotline for the media are available. The site is well-signed and dotted with art pieces and placards, attracting families and curious Hong Kongers from all over the city. 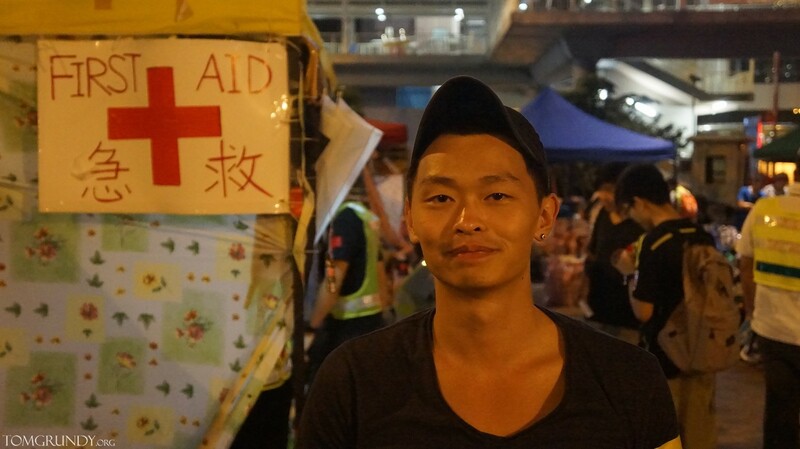 Bosco Cheung, a 19-year-old Chinese University of Hong Kong student, is in charge of the camp’s last supply tent at the western end of Admiralty. Anonymous people in facemasks also visit his station. However, instead of accosting volunteers they donate food, water, snacks and “defensive” supplies like goggles, cling film and face masks used to protect against tear gas. Cheung speculates many hide their identities because some work for the government. 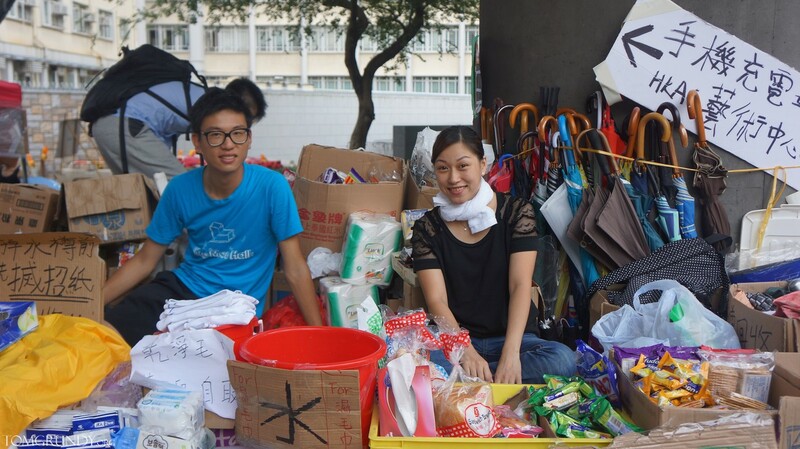 “They want to help but don’t want to show their faces,” Cheung says. Walkie-talkie in hand, Cheung radios back to a central distribution point if his supply tent is running low on any essential items. Volunteer minivan drivers like Simpson Sung, in his sixties, are often cheered and applauded as they pass through. Today, Sung was delivering hot food donated by local cha chaan tengs (tea restaurants). Everything at the supply tents is handed out free of charge, though people are encouraged to take only what they need. If anyone donates money, Cheung says it will be gathered and placed in the nearest charity box. In this case, “Ronald McDonald House” is the beneficiary of cash given to the occupier, as McDonald’s is close by. 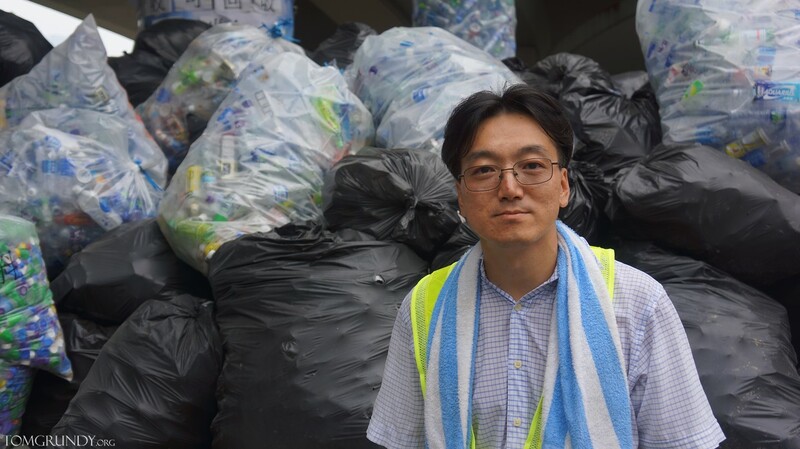 As a group of students scrub the road clean of some graffiti which appeared overnight, Ricky Fan, chairman of the Hong Kong Environmental Protection Association, is coordinating volunteers in a far corner of the site. Stood in front of a mountain of recyclable trash, Fan says that over 300,000 bottles have been recycled already. Bottles, cans and paper are recycled by a team of 300 volunteers working throughout the day and night. Umbrellas and towels are also collected and reused. “Some parents bring their children to help. Some tell me that their boy doesn’t do any housework, but here they work hard,” Fan says. Also staking out government headquarters in shifts are journalists, some of whom flew in last week with little idea of how to navigate the city and its politics. International high school students Eugene Chan, 17, and Chris Choi, 16, are around to help reporters as fixers and translators. 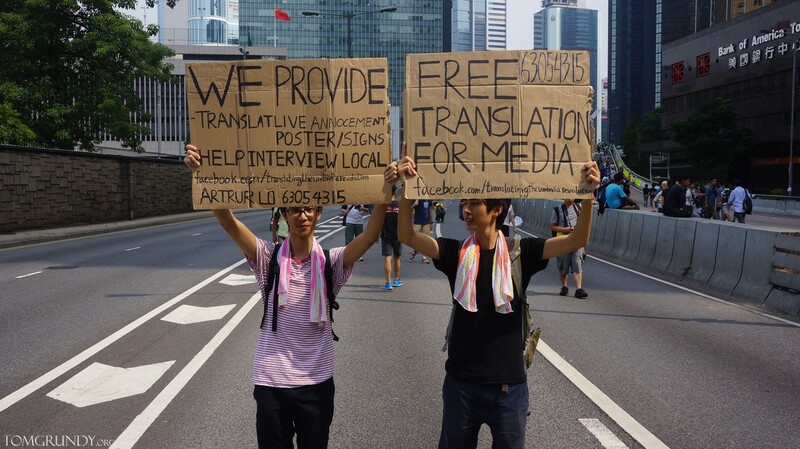 They hold a sign featuring a hotline number operated by around ten friends happy to translate between Cantonese and English, French, Japanese or Korean. The group also maintains a Facebook page called “Translating the Umbrella Movement” and have helped out CNN, Al-Jazeera, the BBC and the Globe and Mail. 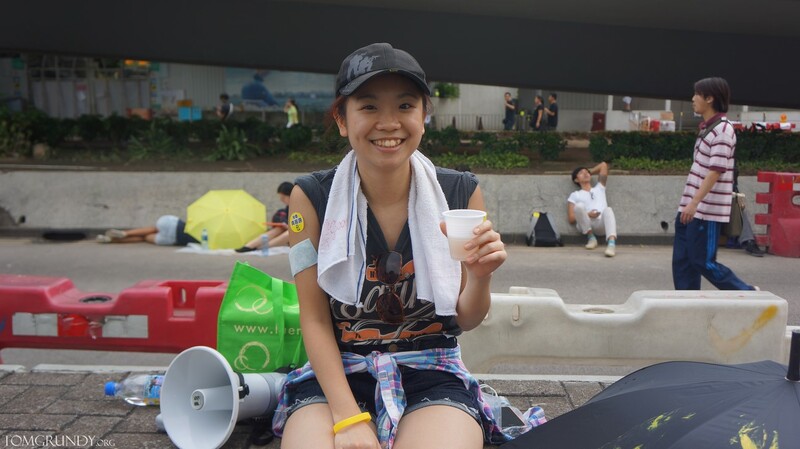 Denise Wong, corporate communications manager at the Hong Kong Red Cross, says that they are keeping their headquarters – near to the Occupy site – open 24-hours a day. “It’s not just tear gas,” she says, “anyone can come in… We provide first aid and psychological support services.” Since September 27th, they have treated 287 injured people – 14 of which whom were referred to hospital, Wong says. Others on site are sharing their creative, artistic and technical skills. 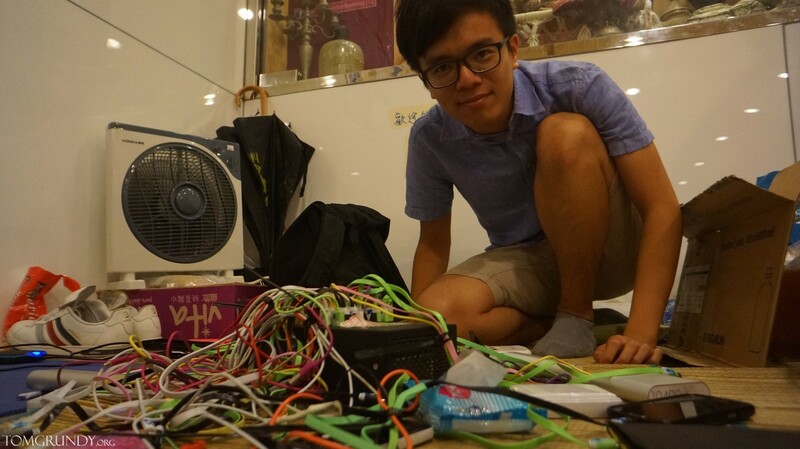 New media researcher and curator Sampson Wong demonstrates all three with his ‘Add Oil Machine’ (a local saying meaning “add energy”). 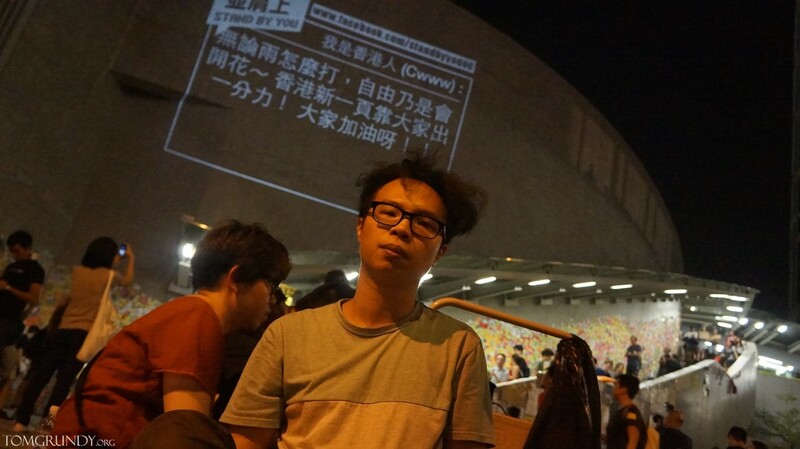 Wong, sporting unruly hair fitting of any tech genius, sits next to projector beaming live messages of support from around world onto an outer wall of the government headquarters building. Anyone with an internet connection can send a message to his crew on Facebook which, in turn, will be pasted into a presentation programme on his laptop. Previously, the process was automated – but the website for receiving messages was maliciously hacked last Thursday. 70,000 people from 60 different countries had visited the site until it went down. Dan Garrett, a PhD candidate studying protest culture at City University of Hong Kong, says that this new generation of protesters represent “a Brave New Hong Kong” of people “willing to fight against hegemonic cultural, economic, social, and political oppression.” Commenting via email, Garrett said that the notion of “carnival as protest” has been around for hundreds of years. 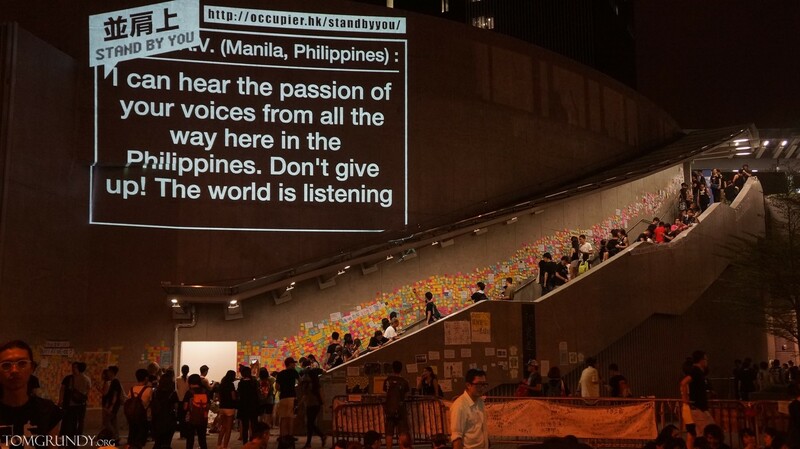 The image of a social movement is a soft power resource that is “part of a strategic contest between regimes and protesters for public opinion and legitimacy,” he said. 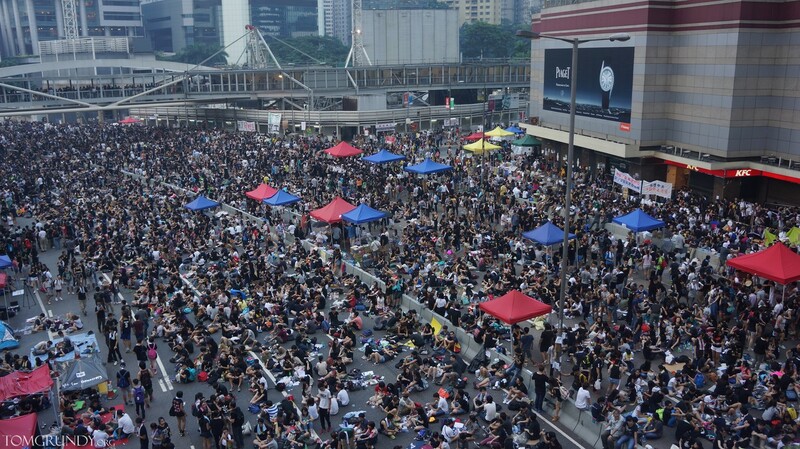 In the run-up to Hong Kong’s occupation protests, the initiators of the movement were called ”radicals” and ”extremists” and their actions dubbed ”terrorism”. Yet the young people peacefully demonstrating for universal suffrage across the city have won hearts and minds across the world in what amounts to a meticulous reading of peaceful dissent. By putting the “civil” in “civil disobedience”, these young protesters have already won an important moral victory, no matter what happens next.